When is your RV resort open? The RV resort is open from May 1st through October 1st. When can I book a reservation? You can book an online reservation starting January 1st for that season. In office or over phone reservations open May 1st. We would love to stay at your Resort but don't have an RV. Do you have rentals? 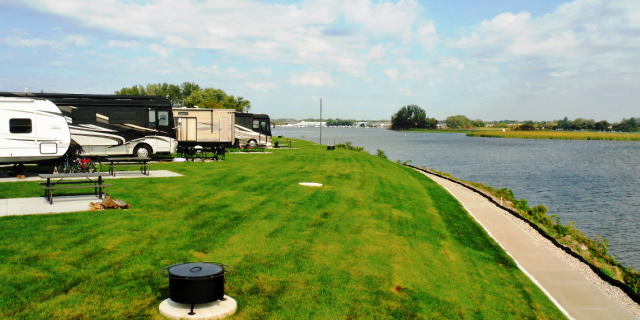 Eastpointe RV Resort works in cooperation with Water's Edge Camper Rental out of Grand Haven, MI to provide the option of renting a unit for use at our Resort. For more information on obtaining a rental unit, please visit www.watersedgecamperrental.com. What do I need to reserve a campsite/rental unit? 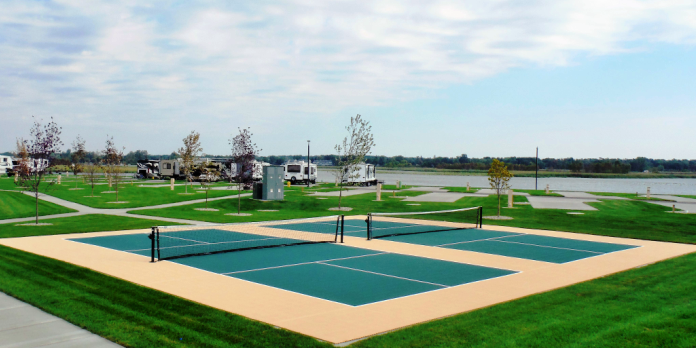 Eastpointe RV Resort is a pay up front facility and requires the total advance deposit for all reservations (Excluding Seasonals) so a credit card will be needed for your reservation’s total deposit. If you are reserving multiple sites, please be prepared to give the total deposit for each site. Cash and checks may be used for deposits as long as they are received at the time the reservation is made in our office. We will also collect your personal information such as name, phone number, mailing address, email address and camping unit information (type and length). We require all guests to understand and accept the terms and cancellation policies in order to complete their reservation. A reservation is not considered complete until you have received a confirmation number from us. This is located on the last page of the reservation process. We will also email you a confirmation. Please make sure to type in the correct email in the reservation page so that you receive your confirmation! How old do you have to be to reserve a site? To reserve you must be at least 18 years old. We recommend making a reservation at least 8 weeks prior to your arrival date (16 weeks for holiday weekends: Memorial Day, 4th of July, Labor Day) However, we encourage campers to check availability online or when our office opens even if your lead time is less than this. How far in advance should I make a reservation for Coast Guard Festival, holidays, and/or other Grand Haven, MI events? As soon as we open our booking system on January 1st! Sites book extremely fast for the Grand Haven, MI Coast Guard Festival, events and holidays. Our check-in and check-out times are designed to assure that all of our guests’ expectations are met upon arrival. Therefore, it is very important that all of our guests abide by these times. Check-out time on the day of your departure is 12 p.m. (noon). Any guests who do not check out and depart from their site will be charged an additional night’s stay. In the event where failure to depart disrupts the arrival of the next guest – the occupying guest can be fined up to $250 as well as the possibility of being towed at owner’s expense. In some instances an early check-in or late check-out may be available. Please check with the office to see if these are available, as there may be other guests arriving to or departing from your site. An early check-in or late departure MUST have management approval. Our office closes at 10pm. After the office is closed, we will leave a packet in the Late Arrival bin located by the office door. This will include your paperwork and site assignments. Simply pick up the packet with your last name, park on your site, and come register in the morning! We are completely gated so it is important you let us know you are arriving past office hours so that we can provide you a gate code. We also ask that you not arrive in the middle of the night as a courtesy to your site neighbors trying to sleep. How do I schedule a late check out? Late check outs are allowed based upon availability. If a late check out is wanted, you must come to the front office on the day of your departure to check for availability and schedule the late check out, if available. Do I get a refund for leaving early? We do not give refunds for unused portions of your stay. Will my reservation request guarantee a specific RV campsite? A confirmed reservation guarantees an RV site for the dates specified at the time your reservation is made, but DOES NOT guarantee a specific site. Can I request a specific site number? You are making a reservation for a specific site type (Standard, Deluxe, Premium, & Premium River). We will be glad to accept any site requests, but we cannot guarantee you will receive your desired site. We work very hard to do our very best to accommodate your requests based on the availability we have. Please understand that many factors are considered in assigning sites, most notably: date reservation was made, duration of stay, and desire to keep multi-site reservations together -- not based on your time of arrival. For fairness amongst all guests EPRV will not relocate another camper's site assignment simply because that camper has not yet arrived. We reserve the right to change your site number at any time, for any reason. Why don’t you confirm specific campsites? We cannot guarantee site numbers simply because we need to retain the ability to move reservations around in order to fill to capacity, while still trying to meet EVERYONE'S requests. Due to the volume of reservations and different lengths of stays, this policy enables us to meet a higher rate of satisfaction with the majority guests than if specific RV campsites were guaranteed in advance. When will I know my site number? You will receive your site number upon arrival. Can multiple RVs/ group be placed by each other? To make a request please send all confirmation numbers of the group members requesting to be near one another to info@EastpointeRVResort.com. Once ALL confirmation numbers are received, EPRV we will make every effort to keep your group together. Like all reservations, site numbers nor location request is guaranteed. Please keep in mind, sites are assigned by the date the reservation was made-- so for fairness purposes, EPRV will not hold, save, or relocate other guests who booked first to fulfil your group request. EPRV staff recommends all group members make their reservations at or around the same time. As we are an RV Resort, we do not allow tent camping. My RV Is older. Can I still bring it? Eastpointe RV Resort does not have age restrictions for RVs that book short term reservations. However, your RV be presentable in appearance, clean, rust-free and legally registered as a Recreational Vehicle. I have a large family. How many people can you have on one of your RV campsites? In fairness to all of our Eastpointe RV Resort guests, we limit the number of people on each site to a maximum of 8. This number includes your original party and any visitors you may have. Day visitors are allowed, but must stop to register and obtain a visitor pass and parking pass from the office. Please keep in mind, registrants are responsible for the actions of all of the occupants, guests, and invitees of their unit/vehicle/site in the resort. You may cancel your campsite reservation up to 14 days prior to arrival to receive a refund of your deposit less a $25 fee/5% (whichever is greater). Cancellations made within the 14 day policy will forfeit their full deposit and no rain-checks. This policy is openly disclosed and MUST be agreed to before you make a reservation. If you do not arrive and have not cancelled your reservation or informed us of a next day arrival by phone, you will be charged the full amount of your reservation and your reservation will then be cancelled. No exceptions will be made to this cancellation policy. No refunds or credits for early departure. We understand this is a financial commitment, so we encourage campers to make reservations only if they intend to arrive regardless of weather conditions. What is the policy on reservation changes? Reservations may be altered if done 14 days prior to arrival date. Registrants are responsible for all credit card fees aside from their initial reservation when changing a reservation; reducing and/or cancelling days. Please keep in mind, if your current reservation qualifies you for special rates due to length of stay, your reservation change might move you to a different rate schedule. These date changes may result in price changes. Example: if you arranged a 7 day stay at the weekly rate and changed your stay to a 3 day stay you will lose the weekly rate and be required to pay the nightly rate. Why do you have a 14 day cancellation policy? A seasonal business such as ours is significantly affected by cancellations; therefore, we adhere to a strict cancellation policy that we believe helps ensure our ability to operate the resort at our high standards. As with any business, cancellations are unfortunate for the guest as well as the campground, so we have designed our policies to be as fair as possible to both. Your cancellation affects not only the campground but also affects people who have been turned away due to the unavailability of your site you reserved. What if the weather is bad or an emergency happens and I want/have to cancel? We cannot be held responsible for weather, illness, work schedules or other matters affecting our guests and therefore must enforce the cancellation policy regardless of circumstances. Camping is an outdoor experience. We are not responsible for the inconveniences of nature and the cancellation policy still applies. What is included with my site? Each site is paved and includes full hook-ups (water, sewer, electric, cable and Wi-Fi), along with a fire pit and picnic table. What amenities/facilities do you offer to registered guests? Yes, all of our sites are handicap accessible. We also have larger handicap sites available – Please inquire at the office. Yes. Firewood is available for sale here at the camp store. Do you have ice for sale? Yes. Ice is available for sale in the camp store. Where do guests get Pickleball paddles? Stop in at the front office to checkout Pickleball paddles/balls plus lots of other games and sports equipment. All items are free and provided for the enjoyment of our guests! All you have to do is sign the items out with your name and site number. Yes! We have brand new bike, kayak, and paddle board rentals for you to enjoy the resort and beautiful Grand Haven. Stop in at the office for inquiries. There is a boat launch right next door to Eastpointe RV Resort – at East End Park. Where can I store my boat/trailer? Many guests bring their boat on their camping excursion to experience the fun Grand River and Lake Michigan. Check out our brand new boat slips for rent! OR for registered guests, Eastpointe RV Resort will store your boat and/or trailer in our fully gated trailer lot. ALL boats and trailers MUST be registered with a visible tag. Please see the office for more details! Can I store my car tow so that it is not on my site? Absolutely! Let us know before or when you arrive and we will tag it and place it in our trailer lot for you. When you are ready to depart we can have it out and ready to go! We’re happy to host your furry family members! In fact, we think they’ll love our resort (especially the Bark Park next door). Pets must be leashed at all times while at our RV resort, cleaned up after and never be left alone at your site, in your RV or any other area of the park. Proof of rabies vaccination should be provided upon request. Pets should be kept quiet and not disturb other guests. A $35 clean-up fee will be applied to your account if you fail to clean up after your pet. Please see our Pet Policy under our Rules and Regulations for complete details.